I have been remiss in not mentioning this earlier in the day, but today was launch day for Marta Acosta's new Vampire Chat feature over at her always fabulous Vampire Wire. Vampire Wire is a daily must-stop if you are interested in paranormal, urban fantasy, vampire, and paranormal romance news. 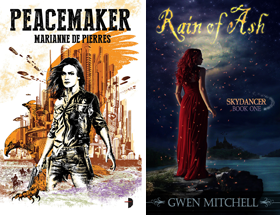 Her first guest is Meljean Brook who talks about her Guardian series, hints at a new steampunk project and offers up a contest. Every week Marta will have a new guest and a book contest. Check out the interview, it is a great kick-off and Meljean is very funny too. We are all in agreement. Vampire Wire is part of my daily blogging ritual.